"Having grown up with my dad as my dentist, I was very particular when looking for a dentist once he retired. I was referred to Dr. Rich for his honesty, kind staff and great dental work. I have been going to him for several years now and have had nothing but top notch service. I would definitely recommend Dr. Rich if you are looking for a great team who cares about your wellbeing. " "I love Dr. Rich and his team. We've been with him for about 2 years. He is really honest and doesn't push dental work on you, so I feel like I can trust his recommendations. The ladies at the front office are really helpful and friendly, too (greet you via name right when you walk in!) "
"My daughter and I have been seeing Dr. Rich for years, and we absolutely love him and his staff! The new office is clean and welcoming. You can't find a better team to care for your teeth!" "This place is the absolute best ever. Dr. Rich is one of the most sweetest guys ever. He takes care of you from the time you hit the door. His staff is amazing and I'm glad I didn't choose any other dental office. For all of you looking for a dental office, just stop by and you won't regret it." "Always a good experience. Personable staff, and most importantly, they respect my time and don't overbook so heavily that they are late for appointments like most dental offices. Our hygienist is great and the dentist is good too!" Poway Dental Arts is committed to helping patients afford their dental care needs. Welcome to Poway Dental Arts! Come in today to take advantage of our new patient special offer! The discreet way to straighten your teeth! We offer free consults and $500 off same-day starts! Are you considering orthodontic treatment? Poway Dental Arts offers a free Invisalign consultation (a $200 value) so you can discover if Invisalign could be the right solution for your smile. In addition, enjoy $500 off Invisalign treatment if you start on the same day as your consultation. If you are paying in full and are uninsured, we will take an additional $500 off. It’s never too late for a beautiful smile! We offer free whitening options to our new patients. 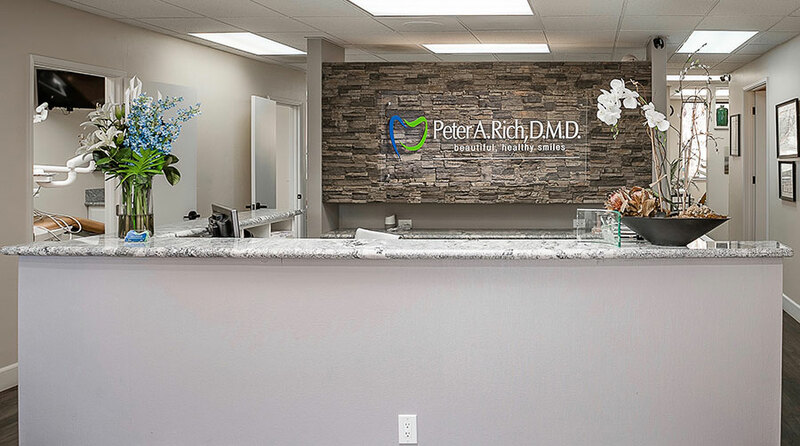 Considered by patients to be the best dentist in Poway, CA, Dr. Peter Rich and his entire dental team are committed to giving you a beautiful, healthy smile. Our focus is always on providing excellent dental care in a comfortable, positive environment. Dr. Rich believes that providing premier dental care requires using the latest technology available. Our dental practice has invested in state-of-the-art equipment to take care of our patients. Our custom designed dental solutions are unique to you, and restore both your smile’s appearance and function. At Poway Dental Arts, we don't treat you like the next person in line: we treat you like family. Our team cares for patients of all ages, including children and seniors. Dr. Rich and his dental team focus on patient education and communication to help you optimize your home care and make the best treatment decisions for your family's oral health.